1. 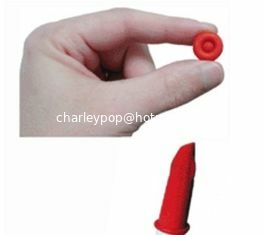 Place the rolled Little Red Cap over the opened tip of the opened tube and unroll. 2. To re-use caulk, simply roll the Little Red Cap off the end of the tube and set it aside for reuse or discard. Storage of Latex type sealants is up to 1 year. Check Little Red Cap for signs of deteriorization after 4 months and replace if necessary. 1. Place The Little Red Cap over the opened caulk tube tip leaving 1/2 inch of empty space. Unroll remaining Little Red Cap down the nozzle. 2. Fill the 1/2 inch empty space in the Little Red Cap with material from tube or bottle. The material will cure in the Little Red Cap creating a plug that seals the tube. 3. When you wish to use the caulk again, simply roll The Little Red Cap to the end of the tube and slowly pull the cured plug and the Little Red Cap off together and discard. Storage of acid cure type sealants is 3 months. Note: For long term storage of any caulking or adhesive, lay tubes horizontally or slightly tip down in a cool, dark place. Keep arts and crafts supplies and glues sealed tight. Store and transport pneumatic tools without allowing dust or dirt into the inlet ports. Keep metal tools like screw drivers pliers and tack hammers from gauging finished metals or fine wood finishes when installing hardware. Keep threads clean while setting or mortaring around toilet or foundation anchors. Keep the tip of your grease gun clean and drip free. Keep rain and dirt out of the barrel in the field. Stop gas and hydraulic lines from leaking while performing automotive and small engine repairs. Keep electrical switches water tight.